Clonex Mist is a ready-to-use foliar spray for mother plants (shortly before taking cuttings) and clones to stimulate root development. Available in three convenient sizes including a 750ml bottle. 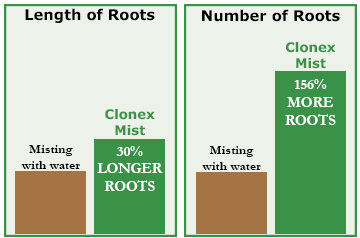 Clonex Mist is formulated to help enhance the health and vigor of tender young plants while promoting robust root development and elongation of root hairs. Dr. Lynette Morgan of Suntec Laboratory in New Zealand performed several independent blind trials using Clonex Mist. In these trials Dr. Morgan showed that the program of using Clonex Mist, along with Clonex Rooting Gel, on Ficus and Dianthus cuttings, generated roots up to 10 days earlier, with the roots being 30% longer and 156% more numerous compared to using water alone to mist plant cuttings. Plus up to 25% quicker rooting!